37 CFR 1.705 Patent term adjustment determination. (B) That there were no circumstances constituting a failure to engage in reasonable efforts to conclude processing or examination of such application as set forth in § 1.704. (2) A showing to the satisfaction of the Director that, in spite of all due care, the applicant was unable to reply to the rejection, objection, argument, or other request within three months of the date of mailing of the Office communication notifying the applicant of the rejection, objection, argument, or other request. The Office shall not grant any request for reinstatement for more than three additional months for each reply beyond three months from the date of mailing of the Office communication notifying the applicant of the rejection, objection, argument, or other request. 37 CFR 1.705(b) provides that any request for reconsideration of the patent term adjustment indicated on the patent must be by way of an application for patent term adjustment which must filed within two months of the date the patent was granted and accompanied by the fee set forth in 37 CFR 1.18(e) and a statement of the facts involved. 37 CFR 1.705(b)(2) provides that such statement of facts involved must specify: (1) the correct patent term adjustment and the basis or bases under 37 CFR 1.702 for the adjustment; (2) the relevant dates as specified in 37 CFR 1.703(a) through (e) for which an adjustment is sought and the adjustment as specified in 37 CFR 1.703(f) to which the patent is entitled; (3) whether the patent is subject to a terminal disclaimer and any expiration date specified in the terminal disclaimer; and (4) any circumstances, if any, during the prosecution of the application resulting in the patent that constitute a failure to engage in reasonable efforts to conclude processing or examination of such application as set forth in 37 CFR 1.704 (or a statement that there were no such circumstances). The two month period set in 37 CFR 1.705(b) is extendable under 37 CFR 1.136 for up to five additional months (permitting patentee to request reconsideration of the patent term adjustment indicated on the patent as late as within seven months after the date the patent was granted). The Office will conduct a manual redetermination of patent term adjustment in response to a request for reconsideration of the patent term adjustment. The Office makes the patent term adjustment determination indicated in the patent by a computer program that uses the information recorded in the Office's Patent Application Locating and Monitoring (PALM) system, except when an applicant requests reconsideration pursuant to 37 CFR 1.705. See Changes to Implement Patent Term Adjustment Under Twenty-Year Patent Term, 65 FR 56365, 56370, 56380-81 (September 18, 2000) (final rule). The PALM system was not originally designed for the purpose of calculating patent term adjustment as provided in 35 U.S.C. 154(b). The patent term adjustment provisions of 35 U.S.C. 154(b) are complex, with numerous types of communications exchanged between applicants and the Office during the patent application process. Thus, a manual redetermination of patent term adjustment could result in (1) an amount of patent term adjustment that is the amount of patent term adjustment requested by the applicant; (2) the same amount of patent term adjustment as indicated in the patent (i.e., there being no change); or (3) a different amount of patent term adjustment that may be higher or lower than the patent term adjustment as indicated in the patent. If the patent term adjustment redetermination results in the amount of patent term adjustment requested by the applicant, the Office will issue a decision granting the request for reconsideration and a certificate of correction that indicates the revised patent term adjustment. If the patent term adjustment redetermination results in the same amount of patent term adjustment as indicated in the patent (i.e., there being no change) and the Office does not require any additional information to render a decision on the request for reconsideration, the Office will issue a decision denying the request for reconsideration, and this decision is the Director's decision on the applicant's request for reconsideration within the meaning of 35 U.S.C. 154(b)(4) . If the patent term adjustment redetermination results in a different amount of patent term adjustment (higher or lower than the patent term adjustment indicated in the patent), the Office will issue a redetermination of patent term adjustment that explains how the Office arrived at the different amount of patent term adjustment. This redetermination of patent term adjustment is not the Director's decision on the applicant's request for reconsideration within the meaning of 35 U.S.C. 154(b)(4) , but is simply a new patent term adjustment determination (e.g., a redetermination). 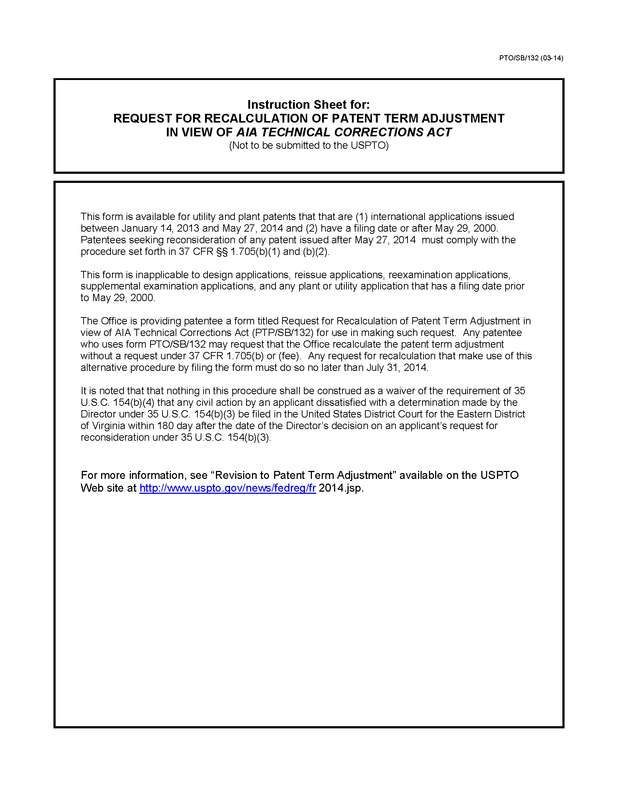 If the Office issues such a redetermination of patent term adjustment in response to the request for reconsideration, the applicant has two months from the date of the redetermination to file a renewed request for reconsideration of the patent term adjustment that addresses the issues included in the Office's redetermination of patent term adjustment. No additional fee under 37 CFR 1.18(e) is required. The two-month period to file a renewed request for reconsideration of patent term adjustment is extendable under 37 CFR 1.136(a). If the patent term adjustment redetermination results in the same amount of patent term adjustment as indicated in the patent (i.e., there being no change) but the Office requires additional information to render a decision on the request for reconsideration of the patent term adjustment, the Office will issue a requirement for information to obtain the additional information. This requirement for information is not the Director's decision on the applicant's request for reconsideration within the meaning of 35 U.S.C. 154(b)(4). If the Office issues a requirement for information in response to the request for reconsideration of the patent term adjustment, the applicant has two months from the date of the requirement for information to file a renewed request for reconsideration of the patent term adjustment. The renewed request should supply the required information and no additional fee is required. This two-month period is extendable under 37 CFR 1.136(a). The Office will again conduct a redetermination of patent term adjustment in response to any renewed request for reconsideration, which is filed in response to a redetermination of patent term adjustment and/or a requirement for information. If this redetermination of patent term adjustment results in the amount of patent term adjustment requested by the applicant, the Office will issue a decision granting the request for reconsideration and a certificate of correction that indicates the revised patent term adjustment. If this redetermination of patent term adjustment results in the same amount of patent term adjustment as indicated in the previous redetermination of patent term adjustment or in the patent, the Office will generally issue a decision denying the request for reconsideration and a certificate of correction, if necessary, indicating the revised patent term adjustment as the result of a redetermination of patent term adjustment. The decision denying the request for reconsideration is the Director's decision on the applicant's request for reconsideration within the meaning of 35 U.S.C. 154(b)(4). In certain, limited circumstances, the redetermination may result in another redetermination of patent term adjustment or requirement for information. In such a case, applicant will be given another opportunity to file a renewed request for reconsideration as described above. Only if the Office issues a decision denying patentee’s request for reconsideration, then patentee may appeal such decision to the District Court for the Eastern District of Virginia by filing a civil complaint within 180 days of the date of the decision on the request for reconsideration of patent term adjustment (within the meaning of 35 U.S.C. 154(b)(4)). Section 1(h)(3) of the AIA Technical Corrections Act amended 35 U.S.C. 154(b)(4) to provide that “[a]n applicant dissatisfied with the Director’s decision on the applicant’s request for reconsideration under paragraph (3)(B)(ii) shall have exclusive remedy by a civil action against the Director filed in the United States District Court for the Eastern District of Virginia within 180 days after the date the Director’s decision on the applicant’s request for reconsideration.” The change to 35 U.S.C. 154(b)(4) clarifies that (1) a civil action under 35 U.S.C. 154(b)(4) is not an alternative to requesting reconsideration of the patent term adjustment under 35 U.S.C. 154(b)(3) but is the remedy for an applicant who is dissatisfied with the Director’s decision on the applicant’s request for reconsideration under 35 U.S.C. 154(b)(3); and (2) a civil action provided in 35 U.S.C. 154(b)(4) is the exclusive remedy for an applicant who is dissatisfied with the Director’s decision on the applicant’s request for reconsideration. In other words, an applicant that is dissatisfied with the patent term adjustment determination on the patent must first request reconsideration under 35 U.S.C. 154(b)(3) and 37 CFR 1.705(b). Only after receiving a decision denying the request for reconsideration, may the applicant file a civil action, proscribed in 35 U.S.C. 154(b)(4), if the applicant is dissatisfied with the decision on the request for reconsideration. This statutory change is applicable for all patents that issue on or after January 14, 2013. For patents that issued prior to January 14, 2013, 35 U.S.C. 154(b)(4) previously required that patentee commence a civil action within 180 days of the grant of the patent. Patentee is not entitled to equitable tolling of the 180-day period to commence the civil action in the district court where patentee did not lack sufficient facts on which it could sue but instead waited until another, unrelated party secured a favorable ruling on a legal theory in another court proceeding. See Novartis AG v. Lee, 740 F.3d 539, 109 USPQ2d 1385 (Fed. Cir. 2014). It is noted, however, that the U.S. District Court for the District of Columbia affirmed a prior decision of the court holding that the 180-day deadline under 35 U.S.C. 154(b)(4)(A) for filing a lawsuit challenging a PTA determination was tolled in the circumstances of that case by the patent holders' timely requests for reconsideration of the PTA determinations set forth in the patents at issue. See Bristol-Myers Squibb Co. v. Kappos, 891 F.Supp.2d 135 (D.D.C. 2012) (denying reconsideration of the decision published at 841 F. Supp.2d 238 (D.D.C. 2012)). Section 1(n) of the AIA Technical Corrections Act provides that amendments made in section 1(h) shall take effect on January 14, 2013 (the date of enactment) and shall apply to the proceedings commenced on or after January 14, 2013. Section 1(n) of the Technical Corrections Act does not limit the applicability of the changes in section 1(h) to applications filed on or after January 14, 2013. Cf. Section 4405(a) of the American Inventors Protection Act of 1999 (AIPA), Public Law 106-113, 113 Stat. 1501, 1501A-552 through 1501A-591 (limiting the applicability of the patent term adjustment provisions of the AIPA to applications filed on or after May 29, 2000 (the date that is six months after the enactment of AIPA)). Patent term adjustment proceedings are not “commenced” until the Office notifies the applicant of the Office’s patent term adjustment determination under 35 U.S.C. 154(b)(3), which now occurs when the patent is granted. Accordingly, the changes to 35 U.S.C. 154 in section 1(h) of the AIA Technical Corrections Act apply to any patent granted on or after January 14, 2013. 37 CFR 1.705(c) implements the provisions of 35 U.S.C. 154(b)(3)(C) and specifically provides that a request for reinstatement of all or part of the period of adjustment reduced pursuant to 37 CFR 1.704(b) for failing to reply to a rejection, objection, argument, or other request within three months of the date of mailing of the Office communication notifying the applicant of the rejection, objection, argument, or other request must include: (1) the fee set forth in 37 CFR 1.18(f); and (2) a showing to the satisfaction of the Director that, in spite of all due care, the applicant was unable to reply to the rejection, objection, argument, or other request within three months of the date of mailing of the Office communication notifying the applicant of the rejection, objection, argument, or other request. 37 CFR 1.705(c) also provides that the Office shall not grant any request for reinstatement for more than three additional months for each reply beyond three months of the date of mailing of the Office communication notifying the applicant of the rejection, objection, argument, or other request (35 U.S.C. 154(b)(3)(C)). 35 U.S.C. 154(b)(3)(C) and 37 CFR 1.705(c) also requires that the request for reinstatement be filed prior to the issuance of the patent. Because 35 U.S.C. 154(b)(3)(C) requires that the request be filed prior to the issuance of the patent, the Office will not consider or act on a request for reinstatement in a paper filed after the patent is issued. For example, a request for reinstatement cannot be made as part of a request for reconsideration under 37 CFR 1.705(b). Applicants are aware during the pendency of the application of situations where the reply was filed more than three months after the Office communication notifying the applicant of the rejection, objection, argument, or other request. If applicants believe that they can make the required showing that, in spite of all due care, the applicant was unable to rely to the rejection, objection, argument or other Office request within three months, then applicants should file the request for reinstatement promptly and no later than at least one day prior to the issuance of the patent. Applicants need not review of the patent term adjustment calculation to establish a request for reinstatement under 37 CFR 1.705(c). The Office will not delay issuance of the patent but will make a decision on the request for reinstatement after the grant of the patent and if appropriate, issue a certificate of correction to revise the patent term adjustment determination on the patent. As noted supra,37 CFR 1.705(c) continues to require that any request for reinstatement of all or part of the cumulative period of time of an adjustment reduced under 35 U.S.C. 154(b)(2)(C), on the basis of a showing that, in spite of all due care, the applicant was unable to respond within the three-month period, must be filed prior to the issuance of the patent. Thus, where an applicant is seeking reinstatement under 35 U.S.C. 154(b)(3)(C) of patent term adjustment reduced under 35 U.S.C. 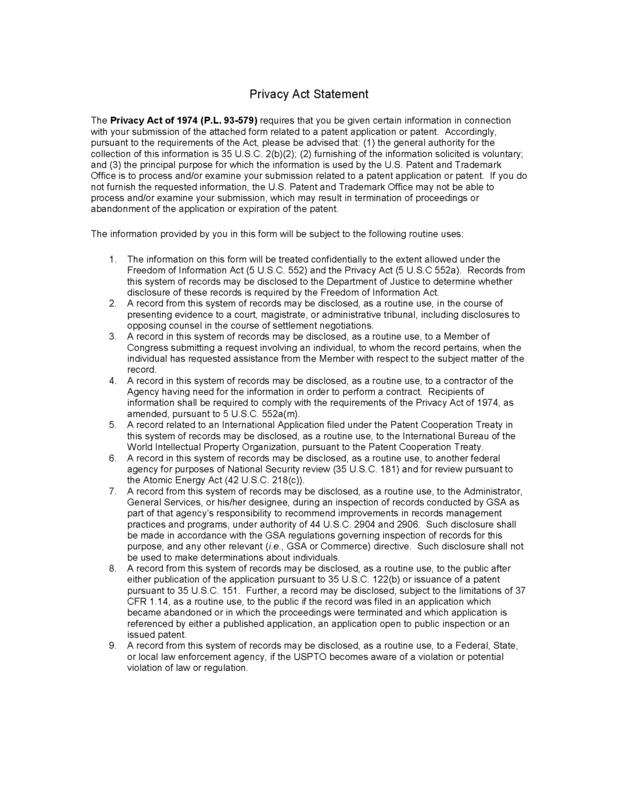 154(b)(2)(C), the showing required by 35 U.S.C. 154(b)(3)(C) must be filed prior to the issuance of the patent. However, where the patentee is not seeking reinstatement under 35 U.S.C. 154(b)(3)(C) of patent term adjustment reduced under 35 U.S.C. 154(b)(2)(C), but is simply contending that the Office's patent term adjustment determination is in error with respect to the three-month timeframe in 35 U.S.C. 154(b)(2)(C)(ii) (e.g., a reply is filed within the three-month timeframe in 35 U.S.C. 154(b)(2)(C)(ii), but the Office's patent term adjustment determination treats the reply as having been filed outside the three-month period in 35 U.S.C. 154(b)(2)(C)(ii)), any request for reconsideration or review of a patent term adjustment determination is by way of an application for patent term adjustment under 37 CFR 1.705(b) filed no later than two months from the date the patent was granted (this two-month period being extendable under the provisions of 37 CFR 1.136(a)). Filing a reply outside of three months after an Office action is per se a failure to engage in reasonable efforts to conclude prosecution under 35 U.S.C. 154(b)(2)(C)(ii) unless applicant can establish that the delay was “in spite of all due care.” The provisions of 35 U.S.C. 21(b) are applicable to the determination of three-month period for reply. If the last day of the three-month period from the Office communication notifying the applicant of the rejection, objection, argument, or other request falls on a Saturday, Sunday, or federal holiday within the District of Columbia, then action, may be taken, or the fee paid, on the next succeeding secular or business day without loss of any patent term adjustment under 37 CFR 1.704(b). See ArQule v. Kappos, 793 F.Supp2d 214 (D.D.C. 2011). For example, an applicant’s three-month reply time period expires on a Saturday and the applicant files a reply that is received by the Office on the following Monday, which is not a federal holiday within the District of Columbia. In this case, any patent term would not be reduced under 37 CFR 1.704(b) because the reply was received on Monday, the next succeeding secular or business day after the expiration of the three-month reply time. Accordingly, a request for reinstatement of all or part of the period of adjustment under 37 CFR 1.705(c) would not be applicable since applicant would not have been deemed to reply more than three months from the date of the Office action. The Office “shall reinstate all or part of the cumulative period of time of an adjustment reduced under [35 U.S.C. 154(b)(2)(C)] if the applicant… makes a showing that, in spite of all due care, the applicant was unable to respond within the 3-month period….” See 35 U.S.C. 154(b)(3)(C). The “due care” of a reasonably prudent person standard has been applied in deciding petitions under the “unavoidable delay” standard of 35 U.S.C. 133. See In re Mattullath, 38 App. D.C. 497, 514-15 (1912) (“the word ‘unavoidable’ … is applicable to ordinary human affairs, and requires no more or greater care or diligence than is generally used and observed by prudent and careful men in relation to their most important business”) (quoting and adopting Ex parte Pratt, 1887 Dec. Comm’r Pat. 31, 32-33); see also Ray v. Lehman, 55 F.3d 606, 609, 34 USPQ2d 1786, 1787 (Fed. Cir. 1995) (“in determining whether a delay…was unavoidable, one looks to whether the party…exercised the due care of a reasonably prudent person”). While the legislative history of the American Inventors Protection Act of 1999 is silent as to the meaning of the phrase “in spite of all due care,” the phrases “all due care” and “unable to respond” invoke a higher degree of care than the ordinary due care standard of 35 U.S.C. 133, as well as the “reasonable efforts to conclude processing or examination [or prosecution] of an application” standard of 35 U.S.C. 154(b)(2)(C)(i) and (iii). Therefore, applicants should not rely upon decisions relating to the “unavoidable delay” standard of 35 U.S.C. 133 as controlling in a request to reinstate reduced patent term adjustment on the basis of a showing that the applicant was unable to respond within the three-month period in spite of all due care. (D) a showing that the applicant was unable to reply within the original three-month period due to illness or death of a sole practitioner of record who was responsible for prosecuting the application. 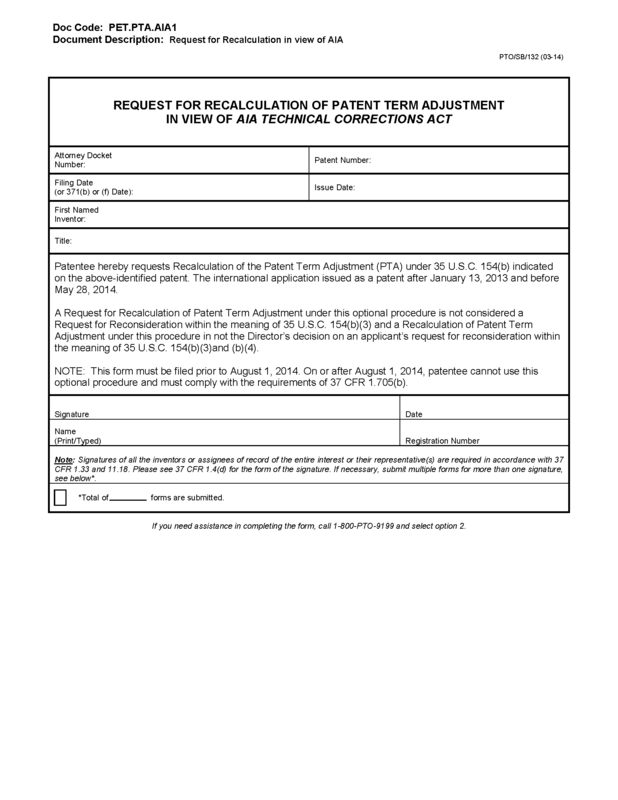 The patent term adjustment reinstated would be limited to the period in which the showing establishes that the applicant was acting with all due care to reply to the Office notice or action, but circumstances (outside applicant’s control) made applicant unable to reply in spite of such due care. An applicant will not be able to show that he or she was unable to reply within the three-month period “in spite of all due care” if the reply was not filed within the three-month period due to reasons within the control of applicant or agencies within the applicant’s control. (F) failure of clerical employees of applicant or applicant’s representative to properly docket the Office action or notice for reply or perform other tasks necessary for reply within the three-month period. Rarely is the power of attorney given to a single attorney and often many attorneys are given power of attorney in an application. An attorney in litigation, working on an interference or taking a vacation is generally aware of that fact before the event and should make plans for another to take over his or her work so that it is completed and filed in the Office within the three-month period. Thus, failure to reply within the three-month period in 35 U.S.C. 154(b)(2)(C)(ii) due to preoccupation with other matters (e.g., an inter partes lawsuit or interference) given priority over the application, or vacation or other non-attention to an application, cannot be relied upon to show that applicant was unable to reply “in spite of all due care” under 35 U.S.C. 154(b)(3)(C). The Office experienced a delay in modifying the computer program used to calculate patent term adjustment with respect to measuring the fourteen-month patent term adjustment period from the date of commencement of the national stage under 35 U.S.C. 371 in international applications. In contrast, the change to 35 U.S.C. 154(b)(1)(B) with respect to measuring the three-year patent term adjustment period from the date of commencement of the national stage under 35 U.S.C. 371 in international applications did not require a change to the computer program used to calculate patent term adjustment because the Office interpreted the phrase ``actual filing date of the application in the United States'' in former 35 U.S.C. 154(b)(1)(B) as meaning the date of commencement of the national stage under 35 U.S.C. 371 in an international application. This software modification required for measuring the fourteen-month patent term adjustment period from the date of commencement of the national stage was completed in April of 2014. Therefore, patent term adjustment determinations for patents issued on or after May 20, 2014 will be consistent with the changes to 35 U.S.C. 154(b) in the AIA Technical Corrections Act. Due to significant delay in modifying the computer program the Office uses to calculate patent term adjustments with respect to the change in 35 U.S.C. 154(b) in the AIA Technical Corrections Act, the Office provided an optional procedure for patentees to request a recalculation of their patent term adjustment without a fee as an alternative to the petition and fee otherwise required to request reconsideration of a patent term adjustment determination under 37 CFR 1.705(b). Specifically, the optional procedure is for patents issued between January 14, 2013 and May 20, 2014, which resulted directly from international applications (i.e., applications that have entered the national stage under 35 U.S.C. 371). The optional procedure is not applicable to patents that resulted from applications under 35 U.S.C. 111(a), including bypass continuations of international applications or continuations of international applications that entered the national stage under 35 U.S.C. 371. Any request for recalculation of patent term adjustment under the optional procedure must have been filed no later than July 31, 2014. See Revisions to Implement the Patent Term Adjustment Provisions of the Leahy-Smith America Invents Act Technical Corrections Act, 79 FR 21736 (May 15, 2014). Under the optional procedure, the Office provided a Request for Recalculation of Patent Term Adjustment form (PTO/SB/132) for use in making such a request. A copy of form PTO/SB/132 is reproduced at the end of this subsection. As discussed previously, this optional procedure and Request for Recalculation of Patent Term Adjustment form (PTO/SB/132) are applicable only for patents issued between January 14, 2013 and May 20, 2014, that resulted directly from an international application. Any request under the optional procedure must have been filed no later than July 31, 2014. The fee specified in 37 CFR 1.18(e) and any fee for a petition under 37 CFR 1.136(a) required for a timely request for reconsideration under 37 CFR 1.705(b) is not a fee paid by mistake or in excess of that required, and the Office may only refund fees paid by mistake or in excess of that required (35 U.S.C. 42(d)). Therefore, the optional procedure is not a basis for requesting a refund of the fee specified in 37 CFR 1.18(e) or the fee necessary for any petition under 37 CFR 1.136(a) for any request for reconsideration under 37 CFR 1.705(b), including any previously filed request that was solely based on the Office's alleged error pertaining to the fourteen-month patent term adjustment period. Applicants seeking a revised patent term adjustment in a patent issued after May 20, 2014, must file a request for reconsideration under 37 CFR 1.705(b) that complies with the requirements of 37 CFR 1.705(b)(1) and (b)(2) within two months of the date the patent issued. Under the optional procedure, to the extent that the procedures adopted under the authority of 35 U.S.C. 2(b)(2) and 154(b)(3) require that any request for reconsideration of the patent term adjustment indicated in the patent must be filed within two months of the date the patent issued and include the information required by 37 CFR 1.705(b)(2) and the fee required by 37 CFR 1.18(e), these requirements were sua sponte waived for patents that met all of the following criteria: (1) The patent issued between January 14, 2013 and May 20, 2014; (2) the patent resulted directly from an international application that has entered the national stage under 35 U.S.C. 371; and (3) the Request for Recalculation of the Patent Term Adjustment form (PTO/SB/132) was filed no later than July 31, 2014. See 37 CFR 1.183. This waiver does not apply to patents issued on or after May 20, 2014, and does not apply to requests that the Office recalculate the patent term adjustment for alleged errors other than the above-identified errors. A request for recalculation of patent term adjustment under the optional procedure to request a recalculation of patent term adjustment is not a request for reconsideration within the meaning of 35 U.S.C. 154(b)(3), and a recalculation of patent term adjustment under the optional procedure is not the Director's decision on an applicant's request for reconsideration within the meaning of 35 U.S.C. 154(b)(3) and (b)(4). Rather, a recalculation of patent term adjustment under the optional procedure is simply a new patent term adjustment determination under 35 U.S.C. 154(b)(3). Any request for reconsideration under 35 U.S.C. 154(b)(3) and 37 CFR 1.705(b) of a new patent term adjustment determination under the optional procedure must comply with the requirements of 37 CFR 1.705(b)(1) and (b)(2) and be filed no later than two months from the date of the new patent term adjustment determination resulting from the recalculation of patent term adjustment. This two-month time period may be extended under the provisions of 37 CFR 1.136(a). Nothing in this optional procedure shall be construed as a waiver of the requirement of 35 U.S.C. 154(b)(4) that an applicant dissatisfied with the Director's decision on the applicant's request for reconsideration under 35 U.S.C. 154(b)(3)(B)(ii) shall have exclusive remedy by a civil action against the Director filed in the United States District Court for the Eastern District of Virginia within 180 days after the date of the Director's decision on the applicant's request for reconsideration under 35 U.S.C. 154(b)(3)(B)(ii).